At Impact Trophies & Medals, we offer a huge range of table football trophies, medals and awards suited to any table football event or competition. Our extensive range includes table football trophies and handmade awards for table football. 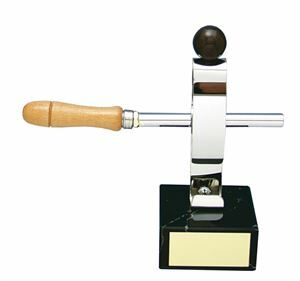 Impact Trophies & Medals are a leading retailer of table football trophies & awards. Great for personalisation, many of our handmade table football trophies and awards can be personalised with free self adhesive engraved text plates, to perfectly meet all your table football presentation needs. Mounted on a solid black marble base, this Table Football Silver Rod Handmade Metal Trophy, features a highly polished stylised silver foosball man and metal rod with a wooden handle. The award is hand crafted from high grade metal to produce a quality award. The table football trophy comes in a choice of 3 sizes. This contemporary Table Football Blue Figure Handmade Metal Trophy features a foosball figure in oxidised blue metal with a gold ball at his feet and part of the rod behind him. 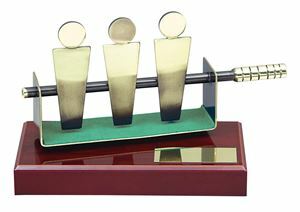 The award is mounted on a solid black marble plinth and has been hand crafted to deliver a high quality award. The trophy is available in 4 sizes. Mounted on a polished wooden base this fun award features a glossy gold metal figure standing next to the goal end of a table football table. The figure has a ball at their feet and has been crafted from premium metal to produce a quality award. 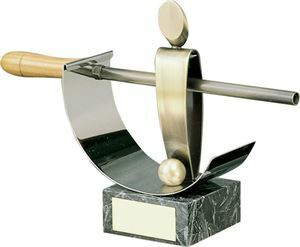 The Table Football Handmade Metal Trophy comes in a large choice of 5 sizes. 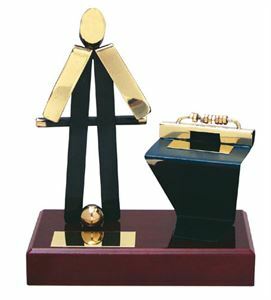 This sleek contemporary, Table Football Gold Rod Handmade Metal Trophy, is mounted on a solid black marble base and features a foosball man figure in brass coloured metal and rod with wooden handle. 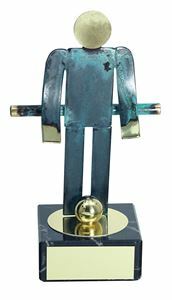 The figure has a ball at his feet and has been crafted from premium metal to produce a quality award. This table football Trophy comes in 3 sizes. This elegantly designed Table Football Handmade Metal Trophy features three foosball men figures on a rod. The table football figures hover over a patch of green fabric and are set on a piano polished wooden base. The award has been hand crafted in Barcelona from premium brass coloured metal to produce a quality award.